A light duty range available in Swivel, Swivel with brake and Fixed options. Wheel diameters from 35mm to 150mm. Load ranges from 30kg up to 200kg per castor. 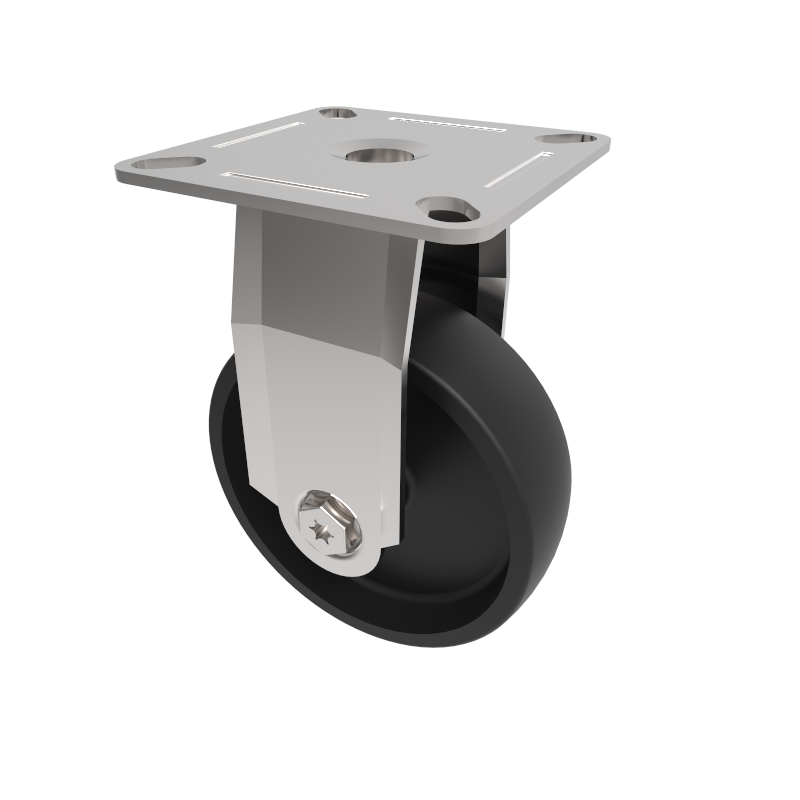 Pressed steel swivel castor with a top plate fixing fitted with black polypropylene wheel with a plain bearing. Wheel diameter 40mm, tread width 17mm, overall height 54mm, top plate 51mm x 51mm, hole centres 37mm x 37mm load capacity 30kg. Pressed steel fixed castor with a 10mm bolt hole fitted with a black polypropylene wheel with a plain bearing. 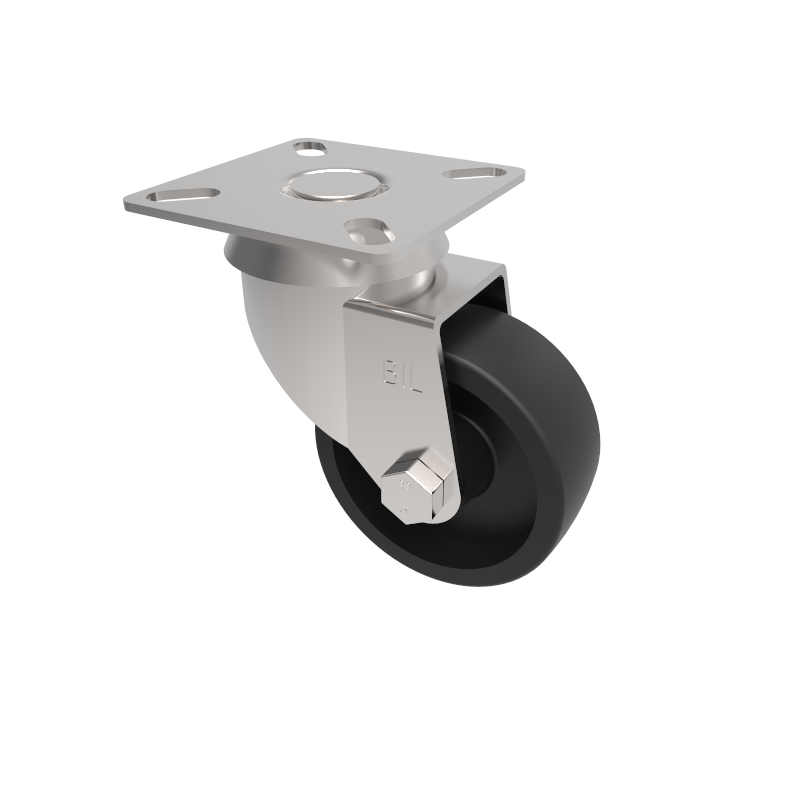 Wheel diameter 50mm, tread width 24mm, overall height 74mm with a Load capacity 50kg. 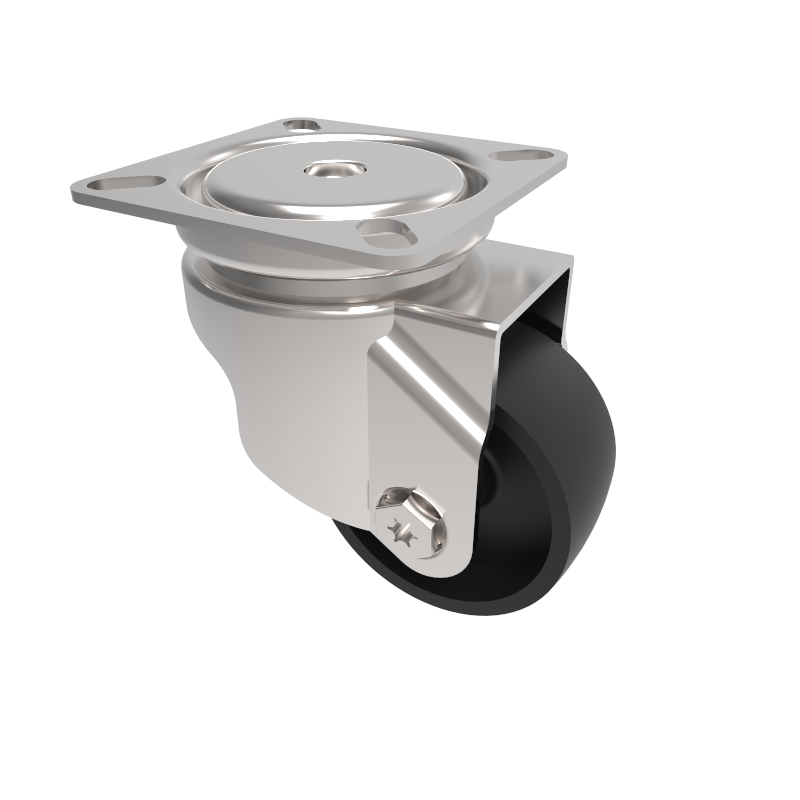 Pressed steel fixed castor with a flat plate fitted with a black polypropylene wheel with a plain bearing. Wheel diameter 50mm, tread width 24mm, overall height 74mm plate size 60mm x 60mm, hole centres 49mm x 49mm or 42mm x 42mm with a Load capacity 50kg. Pressed steel fixed castor with a 10mm bolt hole fitted with a white nylon wheel with a plain bearing. 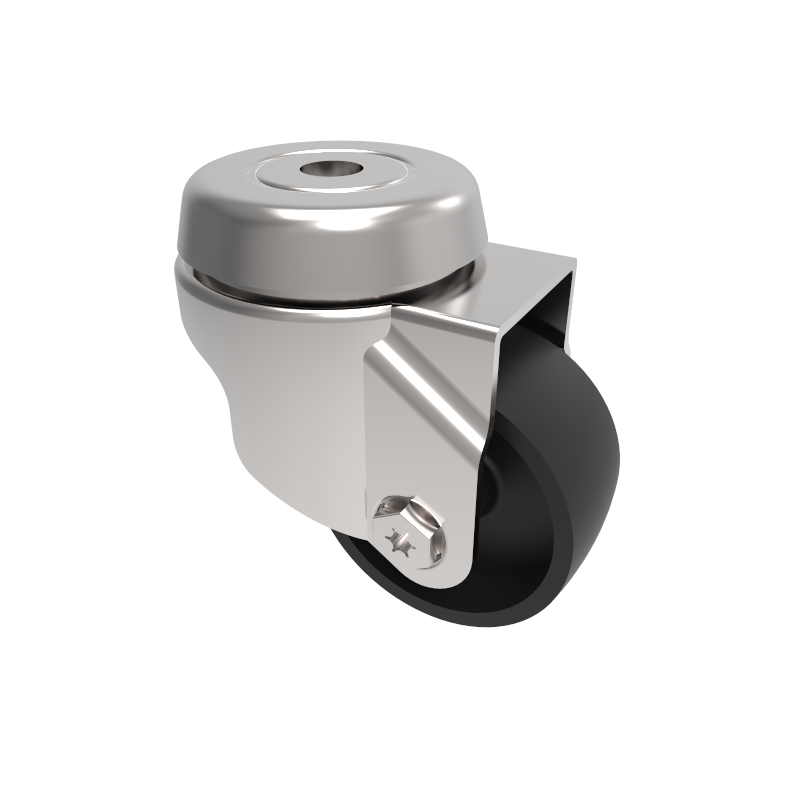 Wheel diameter 50mm, tread width 24mm, overall height 74mm with a Load capacity 50kg. 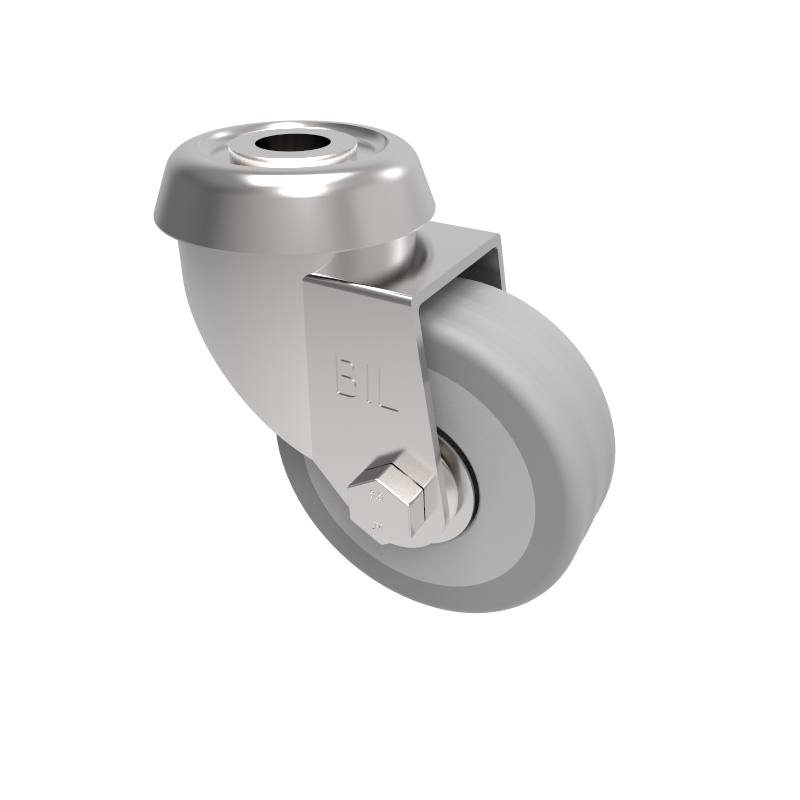 Pressed steel swivel castor with a top plate fixing fitted with grey thermoplastic rubber tyred on grey polypropylene centred wheel with a plain bearing. 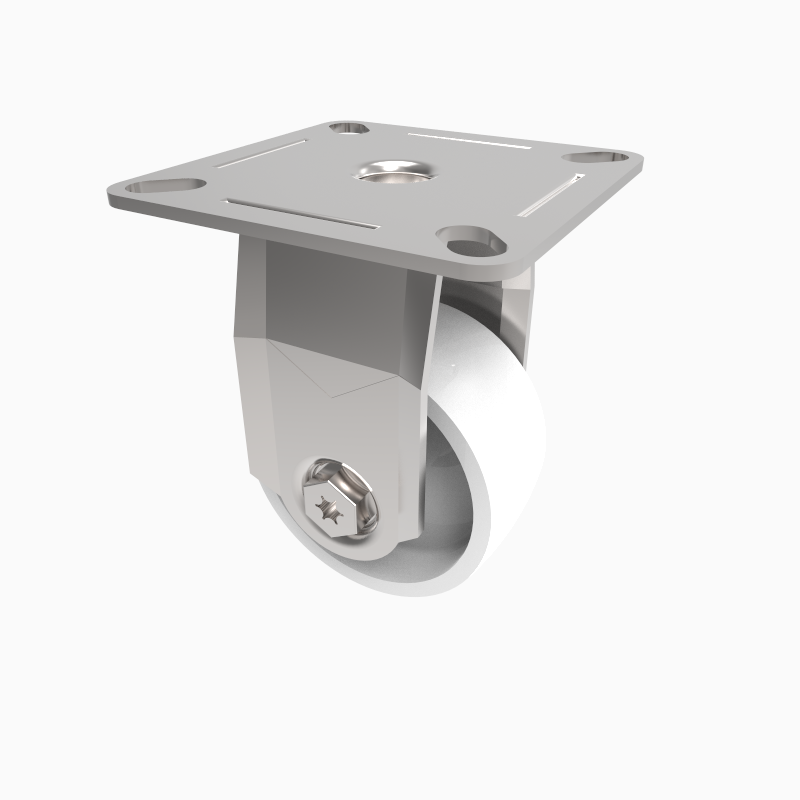 Wheel diameter 50mm, tread width 20mm, overall height 68mm, top plate 50mm x 50mm, hole centres 43mm x 43mm or 35mm x 35mm. Load capacity 40kg. 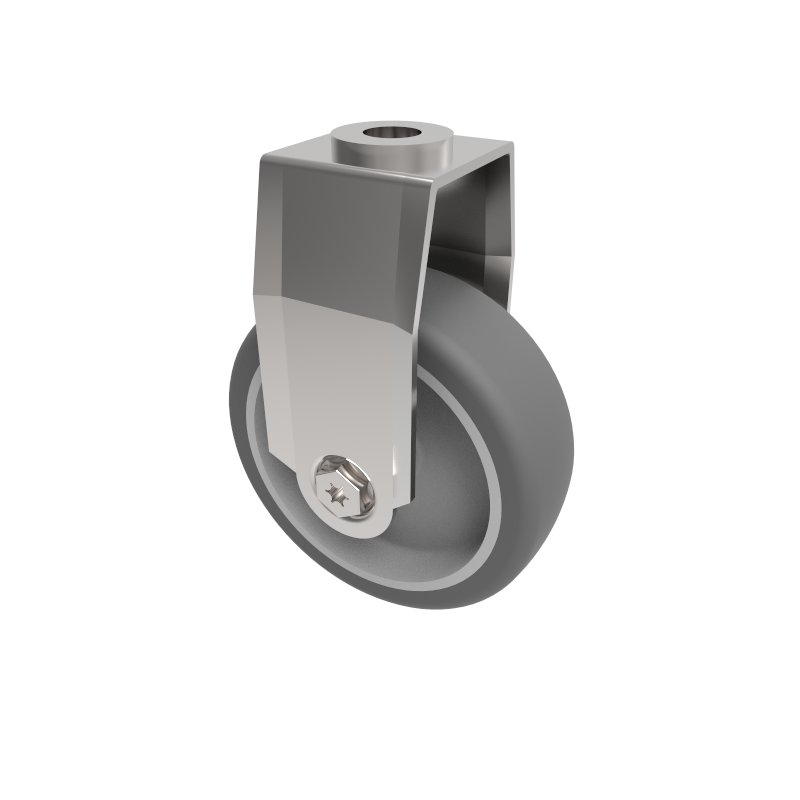 Pressed steel swivel castor with a top plate fixing fitted with grey rubber tyred on grey polypropylene centred wheel with a plain bearing. 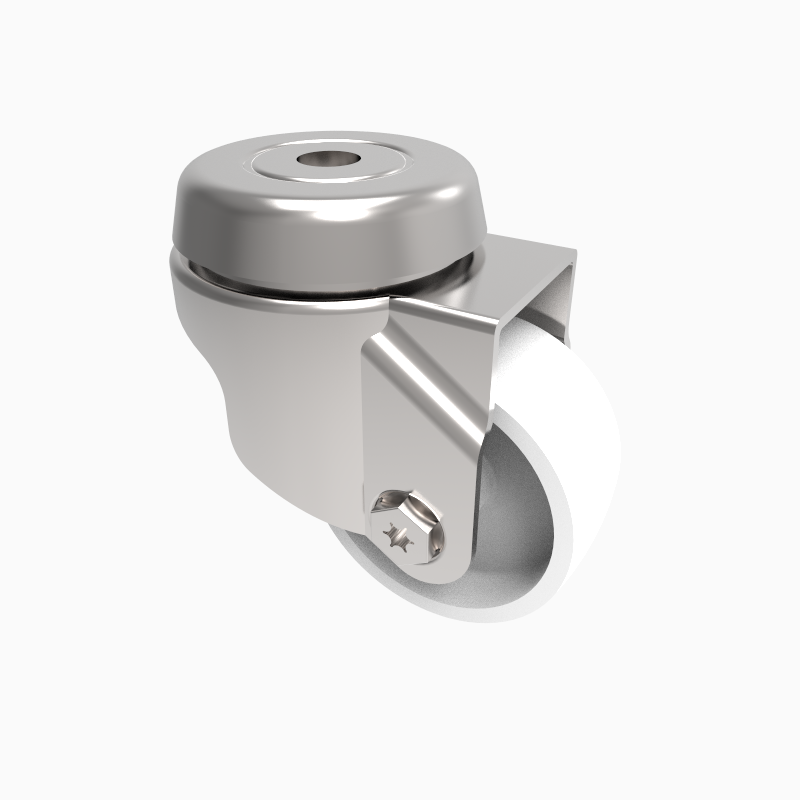 Wheel diameter 50mm, tread width 18mm, overall height 68mm, top plate 50mm x 50mm, hole centres 43mm x 43mm or 35mm x 35mm. Load capacity 25kg. 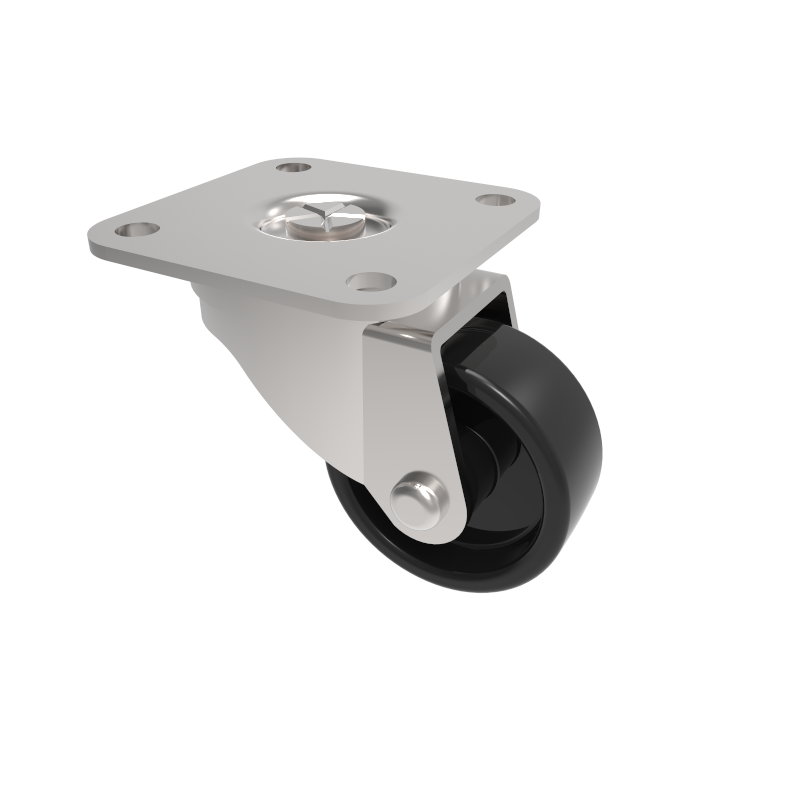 Pressed steel fixed castor with a flat plate fitted with a white nylon wheel with a plain bearing. 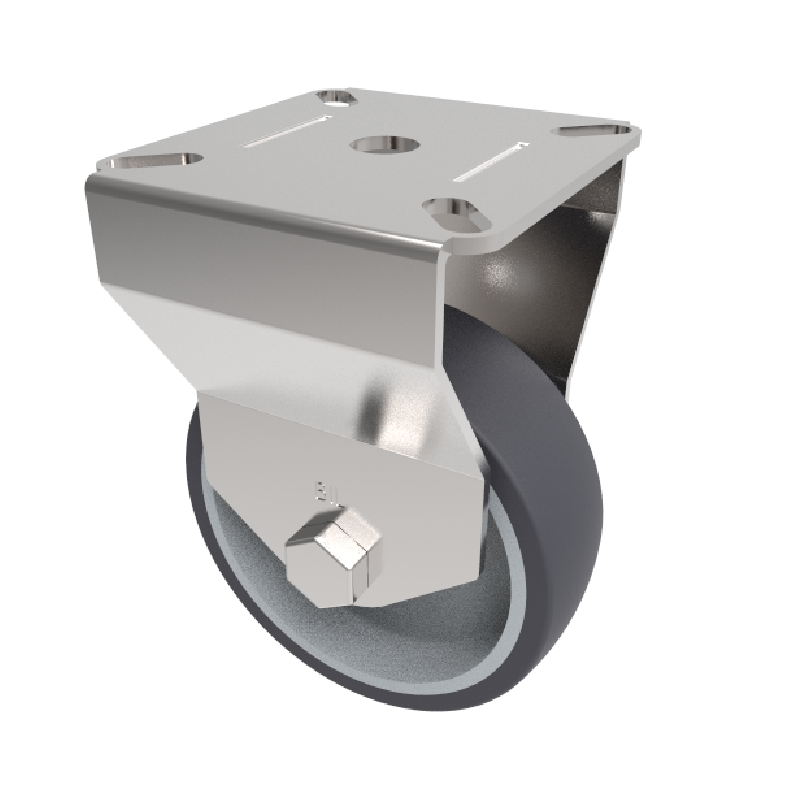 Wheel diameter 50mm, tread width 24mm, overall height 74mm plate size 60mm x 60mm, hole centres 49mm x 49mm or 42mm x 42mm with a Load capacity 50kg. 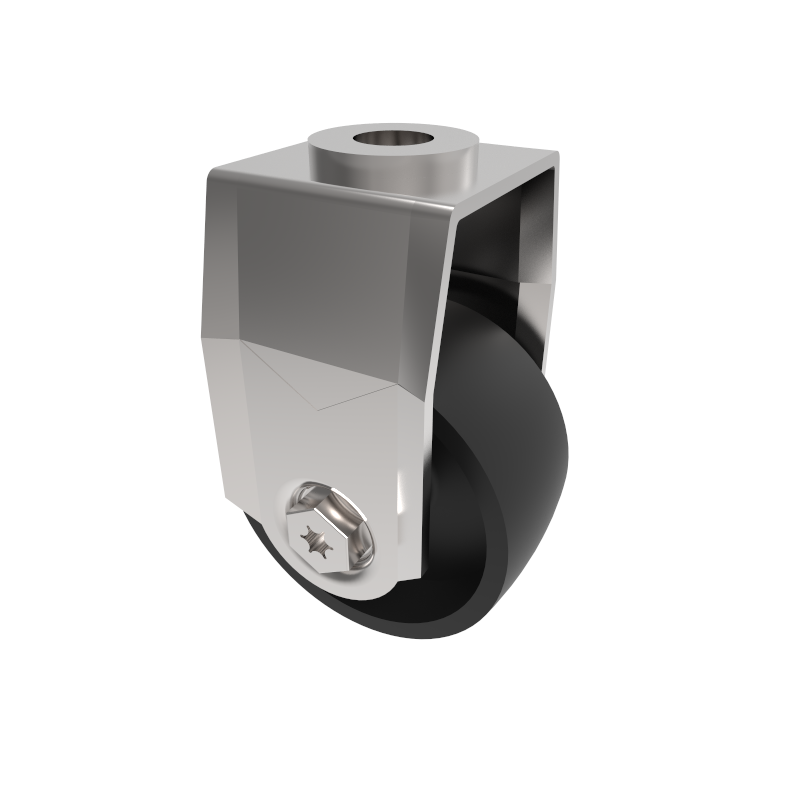 Pressed steel swivel castor with a top plate fixing fitted with a black polyproplene wheel with a plain bearing. 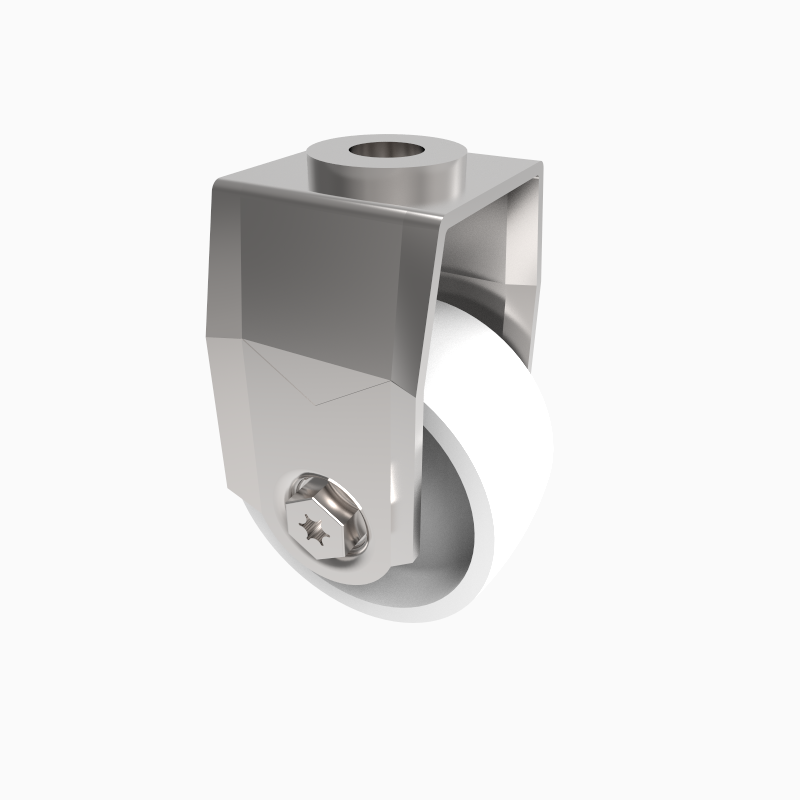 Wheel diameter 50mm, tread width 22mm, overall height 68mm, top plate 50mm x 50mm, hole centres 43mm x 43mm or 35mm x 35mm. Load capacity 40kg. Pressed steel fixed castor with top plate fixing fitted with a black polypropylene wheel with plain bearing. Wheel diameter 50mm, tread width 17mm, overall height 72mm, plate size 60mm x 60mm, hole centres 46mm x 46. Load capacity 40kg. 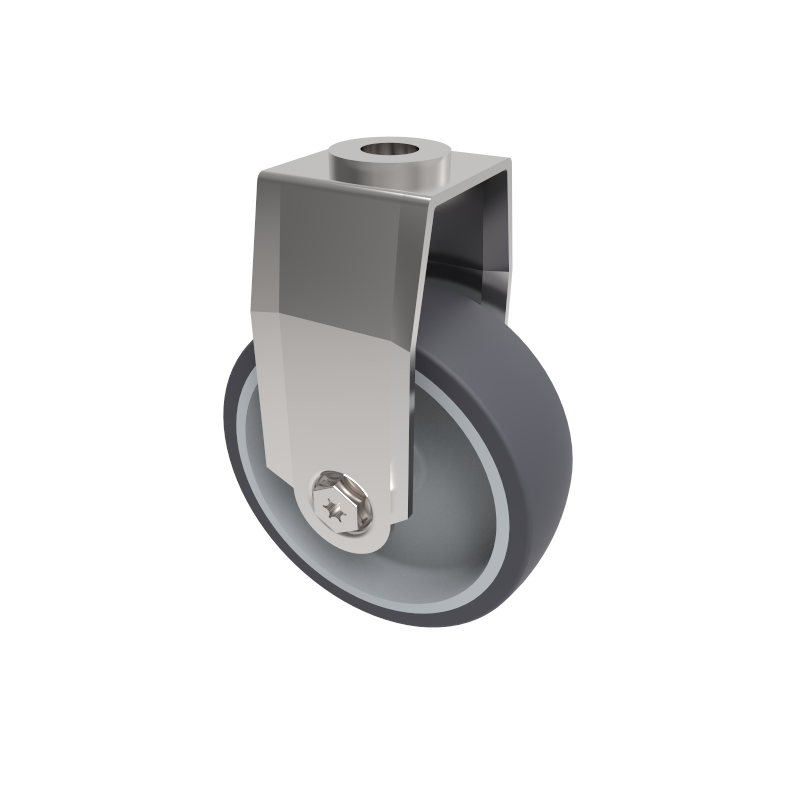 Pressed steel fixed castor with top plate fixing fitted with a grey thermoplastic rubber tyre on grey polypropylene centre wheel with plain bearing. Wheel diameter 50mm, tread width 18mm, overall height 72mm, plate size 60mm x 60mm, hole centres 46mm x 46. Load capacity 40kg. Pressed steel fixed castor with a 10mm bolt hole fitted with a grey thermoplatic rubber tyre on polypropylene centred wheel with a plain bearing. 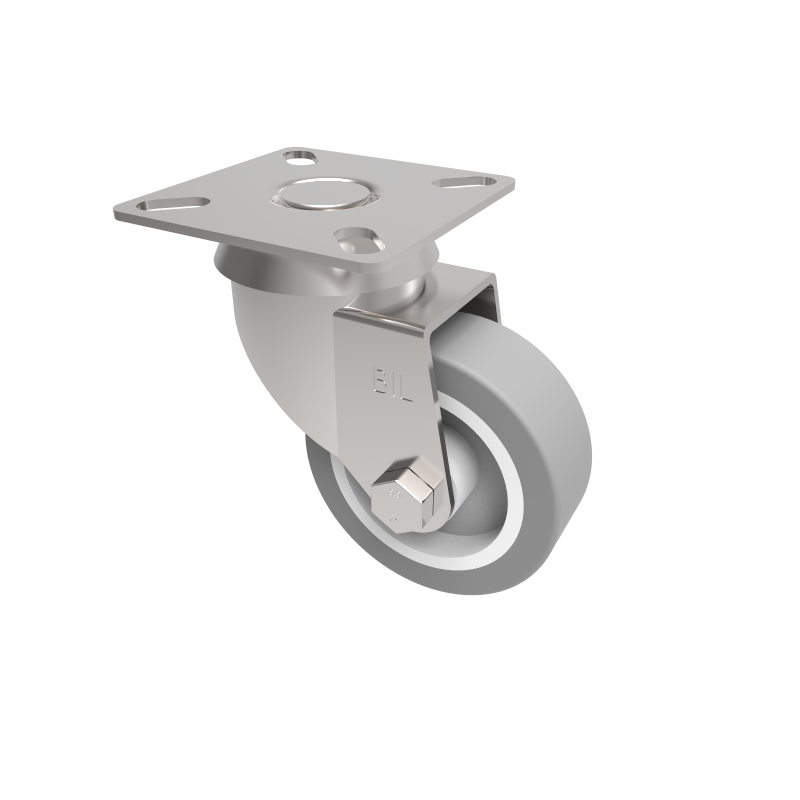 Wheel diameter 50mm, tread width 24mm, overall height 74mm with a Load capacity 50kg. 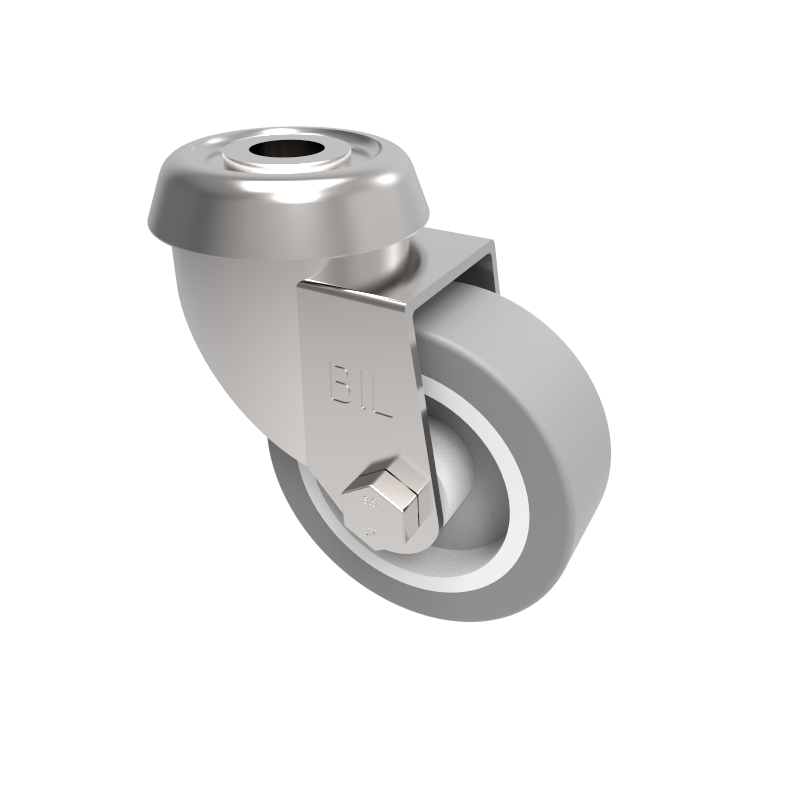 Pressed steel swivel castor with a 10mm bolt hole fitted with a black polypropylene wheel plain bore wheel. 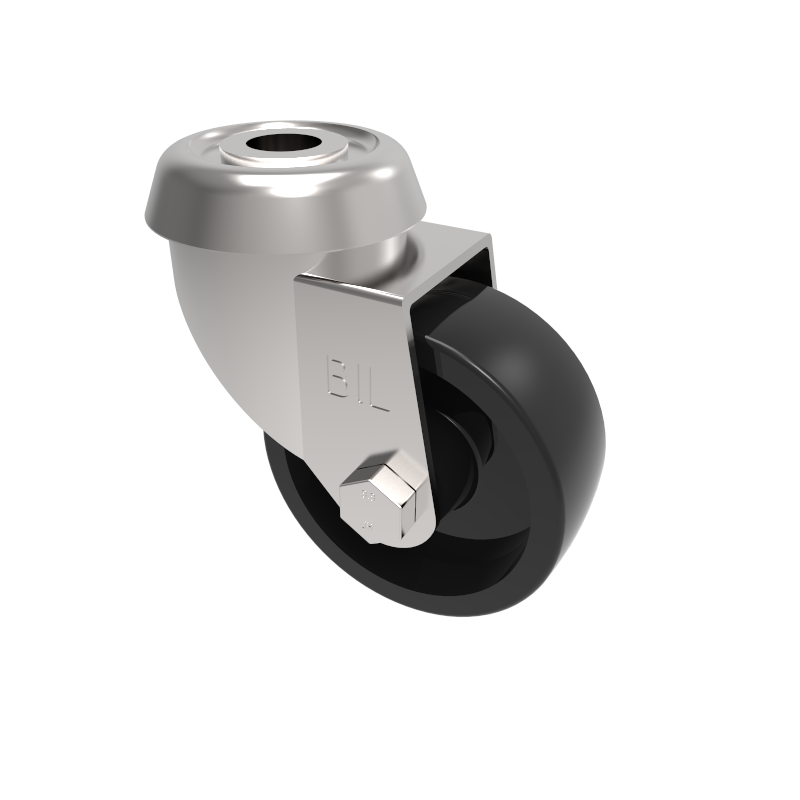 Wheel diameter 50mm, tread width 24mm, overall height 74mm, Load capacity 50kg. Pressed steel fixed castor with a 10mm bolt hole fitted with a black polypropylene centred wheel with a plain bearing. Wheel diameter 75mm, tread width 24mm, overall height 101mm with a Load capacity 50kg. 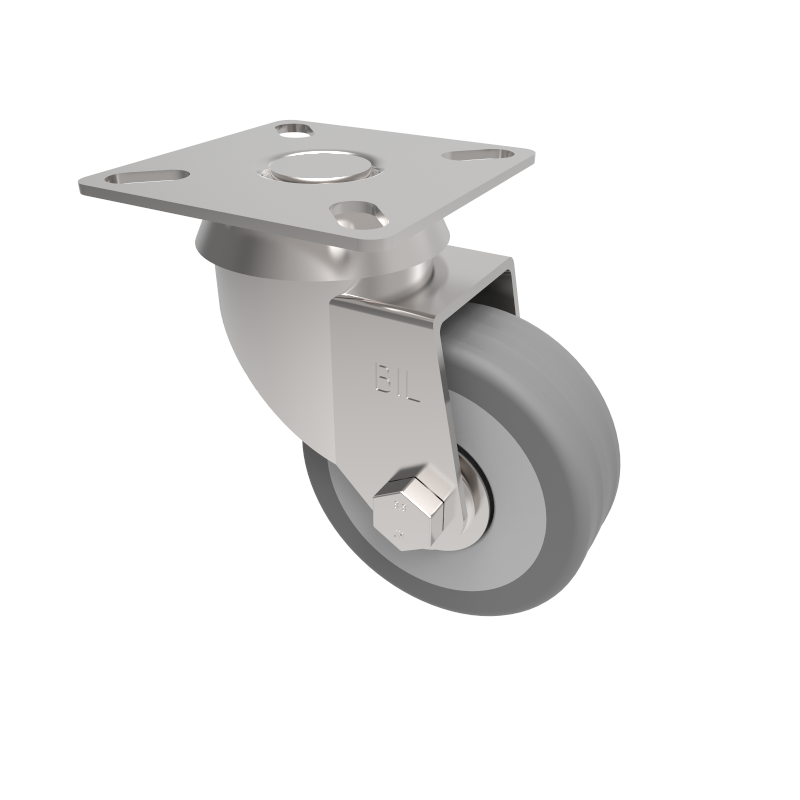 Pressed steel fixed swivel castor with a flat plate fitted with a grey thermoplatic rubber tyre on polypropylene centred wheel with a plain bearing. Wheel diameter 50mm, tread width 24mm, overall height 74mm plate size 60mm x 60mm, hole centres 49mm x 49mm or 42mm x 42mm with a Load capacity 50kg. 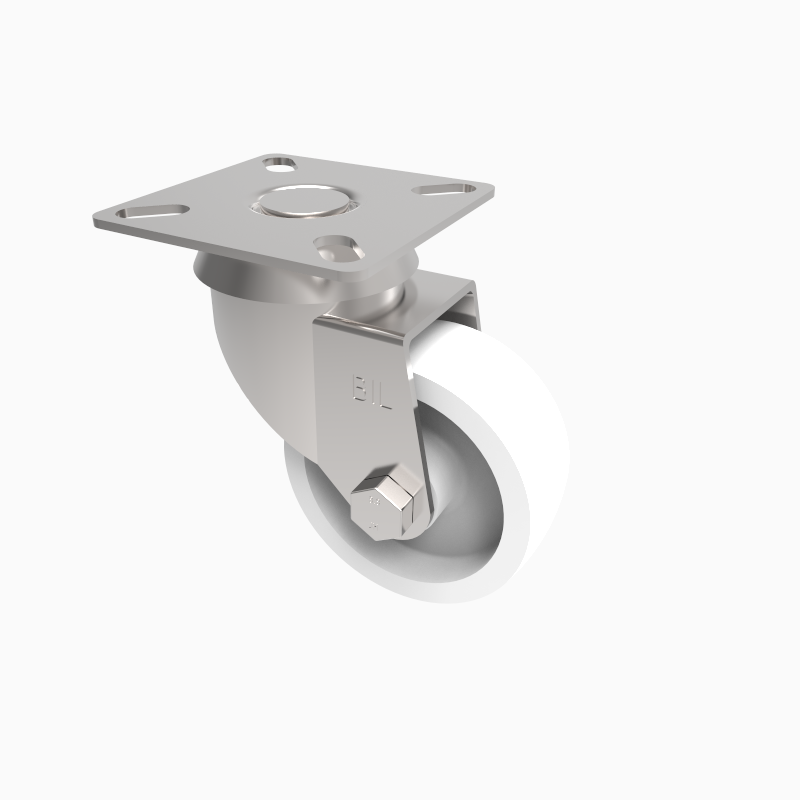 Pressed steel swivel castor with a top plate fixing fitted with a white nylon wheel with a plain bearing. 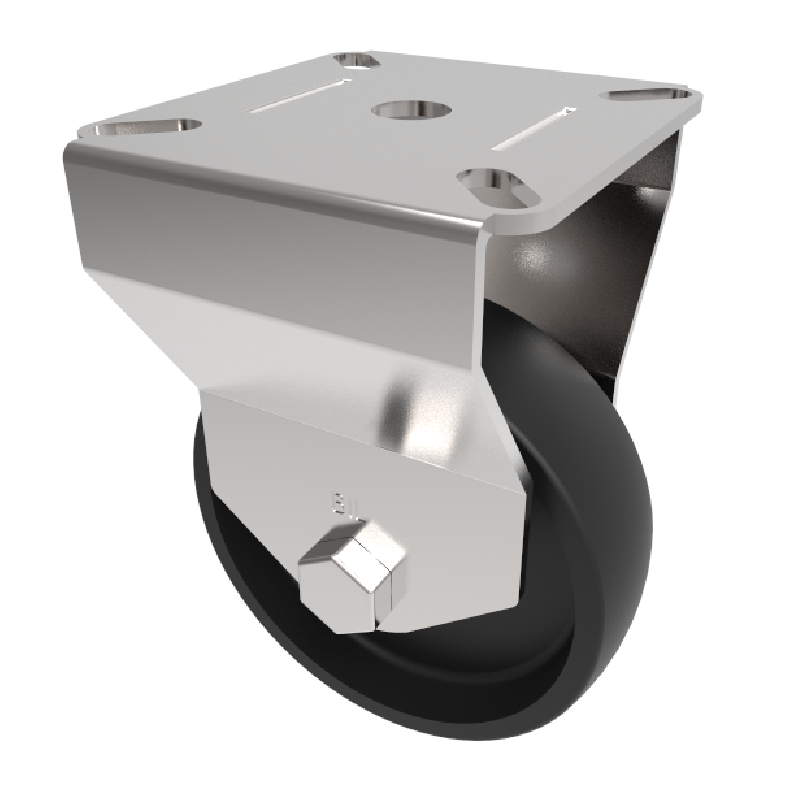 Wheel diameter 50mm, tread width 22mm, overall height 68mm, top plate 50mm x 50mm, hole centres 43mm x 43mm or 35mm x 35mm. Load capacity 50kg. 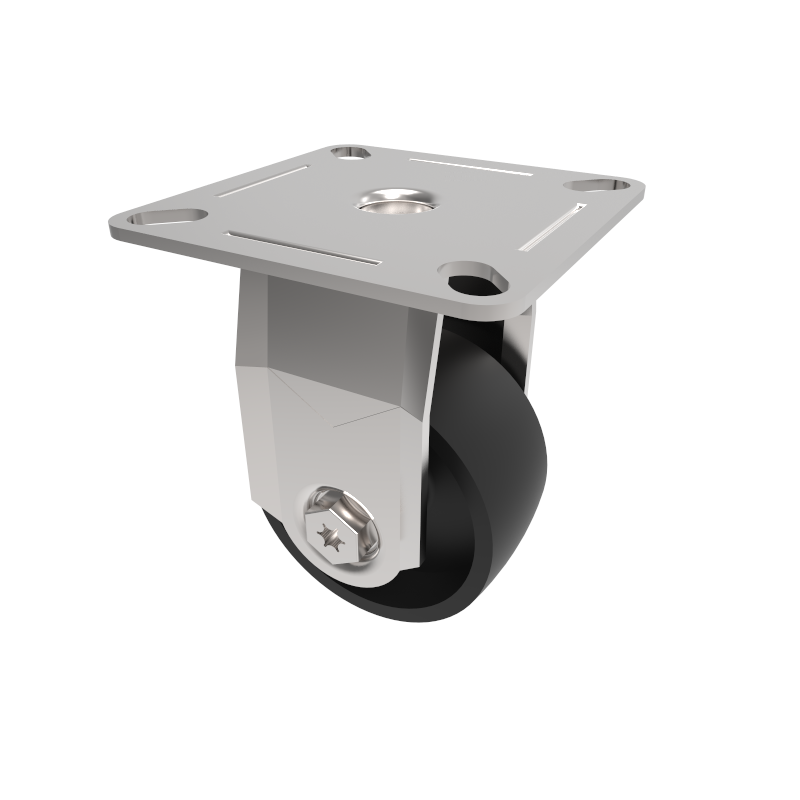 Pressed steel fixed castor with a flat plate fitted with a black polypropylene centred wheel with a plain bearing. 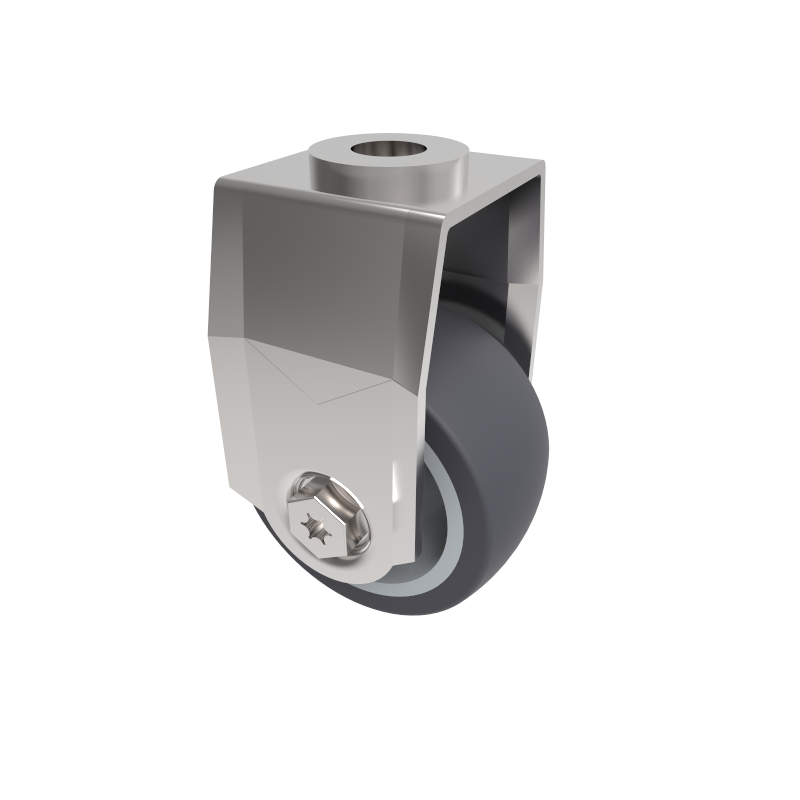 Wheel diameter 75mm, tread width 24mm, overall height 101mm plate size 60mm x 60mm, hole centres 49mm x 49mm or 42mm x 42mm with a Load capacity 50kg. Pressed steel fixed castor with a 10mm bolt hole fitted with a grey thermoplatic rubber tyre on polypropylene centred wheel with a plain bearing. Wheel diameter 75mm, tread width 24mm, overall height 101mm with a Load capacity 50kg. Pressed steel fixed castor with a 10mm bolt hole fixing fitted with a grey rubber tyre on polypropylene centred wheel with a plain bearing. Wheel diameter 75mm, tread width 24mm, overall height 101mm. Load capacity 60kg. 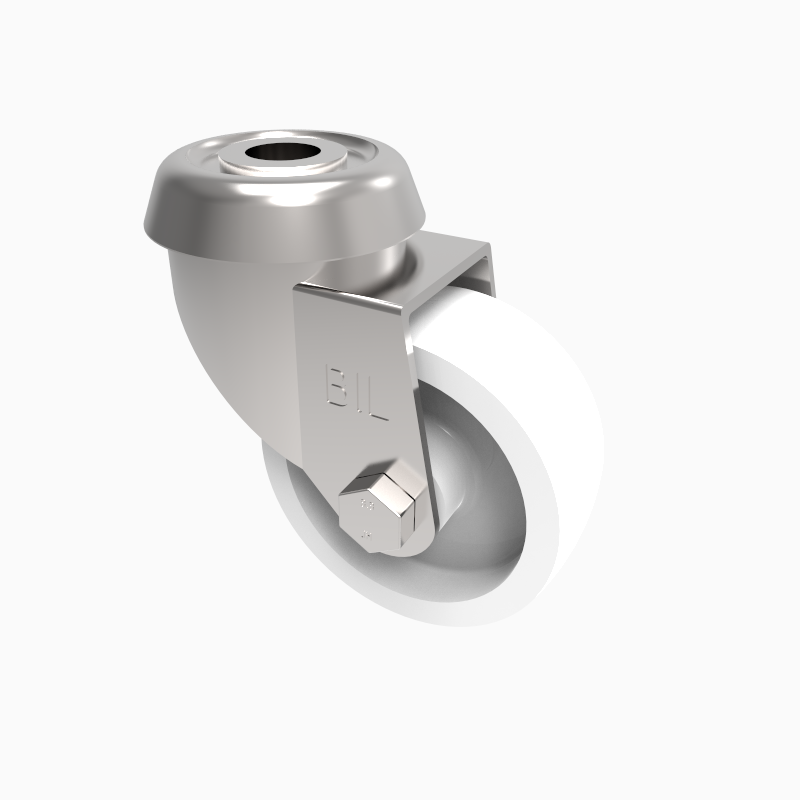 Pressed steel swivel castor with a 10mm bolt hole fitted with a white nylon wheel with a plain bearing. 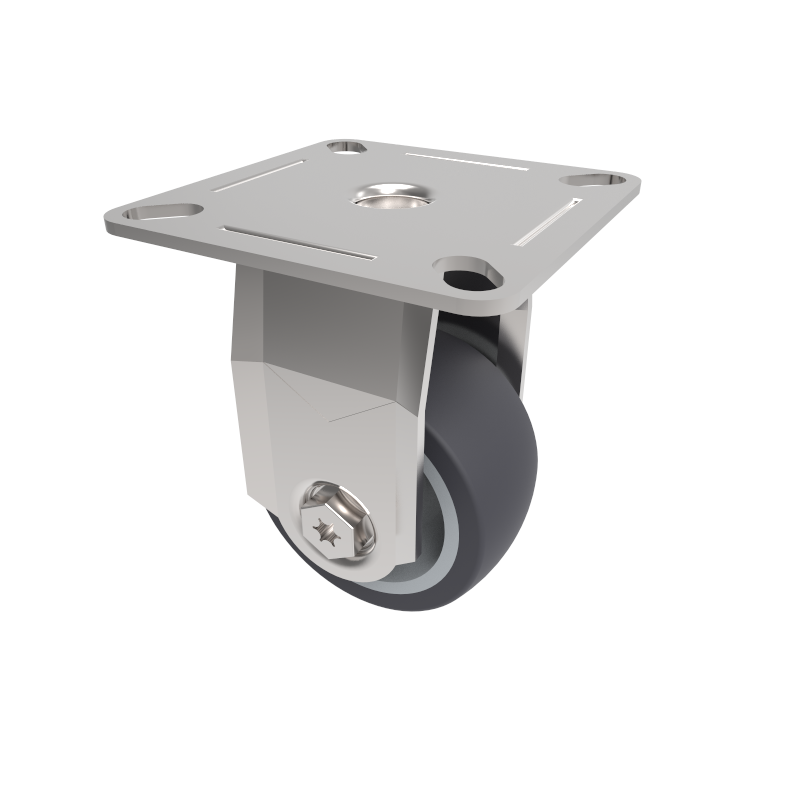 Wheel diameter 50mm, tread width 24mm, overall height 74mm with a Load capacity 50kg. 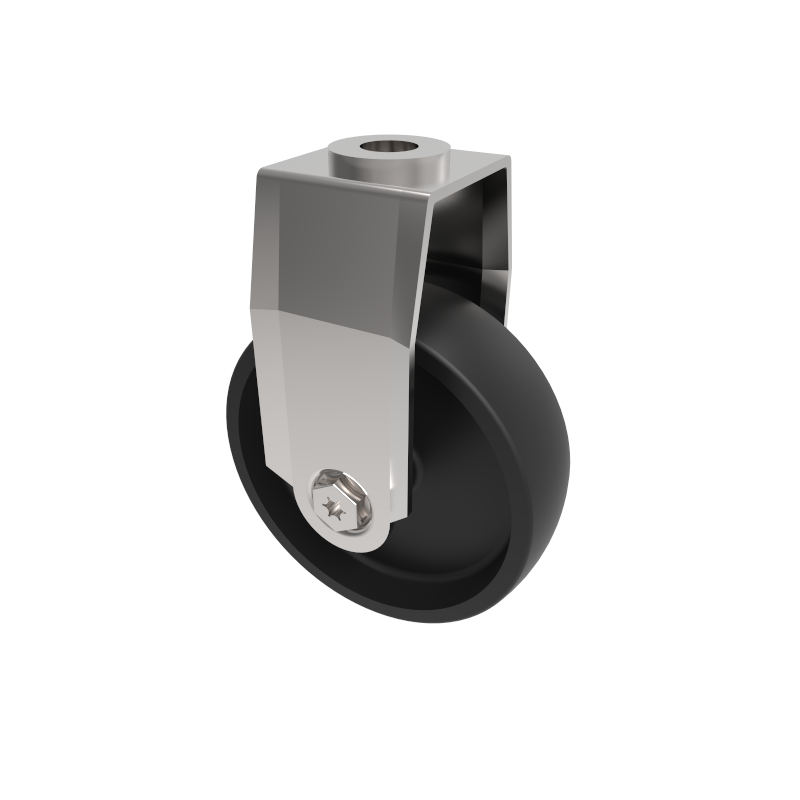 Pressed steel swivel castor with a flat plate fitted with a black polypropylene wheel with a plain bearing. Wheel diameter 50mm, tread width 24mm, overall height 74mm plate size 60mm x 60mm, hole centres 49mm x 49mm or 42mm x 42mm with a Load capacity 50kg.